It’s a well-known fact that kids enjoy a good scare, with some of Disney’s offerings usually having the odd fright, and Harry Potter gradually getting darker over the series. 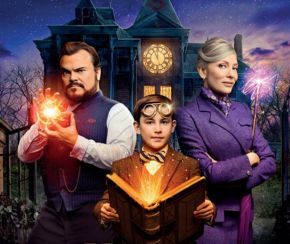 This latest live-action adaptation of a classic children’s novel attempts to push that theory as far as it can go, with the Eli Roth directed The House with a Clock in its Walls. The House with a Clock in its Walls is the adaptation of the 1973 novel of the same name by John Bellairs, and tells the story of 10-year-old Lewis in the year 1955, who is sent to live with his mysterious uncle after losing his parents. He soon discovers his new home isn’t what it seems and is thrust into a world of sorcery. Young Owen Vaccaro (Daddy’s Home) plays Lewis. He’s a very likable lead and carries the film very well. He does accept a few of the big reveals a little too quickly. For the most part he does his best in the role. There’s room for improvement but he has a bright future ahead. The always watchable Jack Black (Jumanji: Welcome to the Jungle) stars as Lewis’s Uncle Jonathan, who’s a perfect choice for the role. This isn’t too different to most of his other roles, but he is able to bring a serious side that we haven’t really seen before, while maintaining his likability and sense of humour. Jonathan’s friend and fellow sorcerer is a woman called Mrs. Zimmerman, played wonderfully by Cate Blanchett (Mowgli). It’s fair to say she does an amazing job here, with the character being pretty different to previous roles. The character is a little nutty, like her cookies, but has some great depth to flesh her out. In a story of good versus evil, there of course need to be a villain and this film has a good one with Kyle MacLachlan as Isaac Izard. He’s a creepy presence that’s sure to give youngsters nightmares. His plan is left a mystery for the majority of the film, but his actions are much more memorable than his reasoning. The story revolves around the mystery of a ticking clock within the walls of the house, with Jonathan becoming more desperate to find it before it stops. Alongside this is Lewis being trained up as a sorcerer. It brings to mind Disney’s The Sorcerer’s Apprentice, but it’s more investing and much darker. This may be a kid’s movie and it does have a story that is geared towards a younger audience, but it isn’t for the sensitive viewers, or at least, kids who scare easily. Directed by Eli Roth (Death Wish), there are several sequences that steer towards horror territory with some genuinely creepy moments, ranging from blood rituals to the raising of the dead. But luckily, there’s more than enough humour to lighten things up and balance the light and dark, with some genuinely funny moments and banter between Jonathan and Mrs. Zimmerman. It doesn’t seem out of place or forced and adds a little more to the film. With the movie surrounding wizardry, there are a lot of effects to bring this world to life, from the beautiful to the scary. There’s some inspired ideas such as the dog-like chair and the morphing window. It does bring to mind similar effects in other movies such as Harry Potter, but they work just as well. This may not have the scale of the Potter films, but that works to its advantage. The story is very condensed with only a few scenes away from the house. The choice of locations is perfect for the film, with the set of the house being both warm and eerie at the same time. The lighting also helps add to this with the darker scenes taking place at night or a dark room, and the lighter with an orange glow. The soundtrack is created by Nathan Barr who manages to find a good balance between magical and intense. It knows when to hold back as the tension builds but lets loose when the action kicks off. It’s not as memorable as it could be, but fits the movie. Overall, this is a great family film with something for everyone. The casting is spot on with some very likable characters. It may not be suitable for every kid, so checking it out before they see it advised. This is a great adaptation of a much beloved classic and sure to kick start a series of adaptations. Purple Revolver rating: 4/5. A spooky and fun mystery.